CHARLOTTE, N.C., March 20, 2019 /PRNewswire/ -- In a recent Ally Invest survey of U.S. adults, nearly 66% of Millennials said they found investing to be intimidating or downright scary. 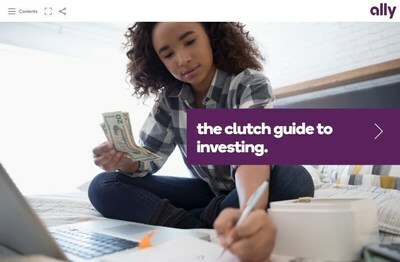 To help get the proverbial investing monster out of the closet, Ally Invest has launched a GenZ- and Millennial-friendly e-book titled The Clutch Guide to Investing. The eBook offers would-be investors a fun-to-read introduction to investing topics as well as some clear steps to get started. "When it comes to investing, young adults are constantly being told that 'time is on their side'," said Dave Dusseault, executive director of Ally Invest. "While that's true, these 18-30 year olds need more than platitudes to help them overcome their many concerns, including how to juggle everyday expenses and debts with saving and investing; how to pick the right investing approach; and where to go for honest, trusted information. This new guide covers those topics in a way that's easy for young adults to understand and absorb, providing the information they need to help conquer their investing fears and understand how to get started."